The staunch and impulsive Reformer, was born in Springfield, Dundee, Scotland, on the 12th of March, 1795, and came to Canada in 1820. He was descended from a peasant parentage, and when a mere infant was thrown for support on his brother. He obtained a meagre business education in Dundee, and at seventeen started for England, where he obtained employment as a clerk with Lord Lonsdale. On the 18th of May, 1824, appeared in Niagra the first number of his paper, The Colonial Advocate. It was roughly written, and dry, and declamatory, but it was on the right side, and made the oligarchists twist uneasily in their chairs. "Every effort", says Mr. Morgan, "except such as reason and the law might have sanctioned, was made to suppress the paper. A bitter personal quarrel, carried on by means of the press, between Mr. Mackenzie and some prominent members of the official party, led, in 1826, to the violent destruction of the printing office by a mob of irritated friends of the ruling party. The office was forcibly entered and the types cast into the bay of Toronto. At this time, the paper was printed at that city. A most inopportune time was chosen for the work of destruction. It was probably not known to the rioters that the last number of the paper which it was intended to destroy had already been published; for if it had the act would have been stupid and illegal. As the act was done in the face of day, the perpetrators of it were known, and damages were recovered against them, on the case being brought into a court of justice. We must suppose that the object of scattering the types into the bay was to put an end to the existence of an obnoxious newspaper; but the effect was precisely the contrary of what had been intended. The paper, of which the last number had already been issued, received from the violence used to put it down a new lease of existence. The Colonial Advocate, instead of expiring in 1826, as it would, if left to itself, continued to be published till 1833, when the press and types were sold to Dr. O'Grady. In 1828, Mr. Mackenzie was elected to the Canadian Parliament, for the County of York. The violence of the official party was not confined to the destruction of a printing office. Mr. Mackenzie had, in his newspaper, used language towards the majority in the Assembly, which that majority chose to regard as libellous, and they resolved to punish the representative for the act of the journalist. The alleged libel consisted of describing the majority as sycophants fit only to register the decrees of arbitrary power. Language quite as strong as this has frequently been used in the House of Commons. For instance, Henry, now Lord Brougham, when in the House of Commons, said of the Minister Peel, 'I do not arraign him as much as I do you, his flatterers, his vile parasites,' for which language, so far from being expelled, he was not even called to order. But admitting the language used by Mr. Mackenzie to be libellous, the proper remedy would have been to bring the case before a jury. But that remedy was hopeless; it was notorious that no verdict could have been obtained against the publisher of the alleged libel. It was treated as a breach of privilege; on that ground the expulsion proceeded, and an attempt was made to render Mr. Mackenzie incapable of sitting in the Assembly. His re-election could not, however, be prevented, for no member of the official party would have had the least chance against him; and as often as he was expelled - five times - he was re-elected; once when he was absent in England". He was chosen first Mayor of Toronto in 1836, and with all his faults, seemed to have been the darling of those who were doing battle for popular rights. His visit to Downing Street when the dominion of the Family Compact was most galling, was productive of several minor results; but it seemed to be our fortune to have gentlemen governing us then, who were conspicuous only for their utter unfitness for the position. Sir Francis Bond Head, with several trunks full of blank poems, plays and unfinished essays, made a great sensation on first appearing here, but he had a soft head, and the Tories promptly brought him into line. He was in Canada in 1837-38, the season of William Lyon Mackenzie's wild uprising near Toronto. Mackenzie did not succeed with his motley band of well-meaning followers, but with a price upon his head, fled the country through the wintry woods. He eventually obtained a pardon through the influence of his friend, Mr. Hume, and returned to Canada. The Reformers gave him the cold shoulder, and the Tories raised their eyes in horror when they looked upon him. In 1850, he opposed George Brown for Haldimand, and defeated him. He held his seat in the Assembly till 1858, when he resigned. He died in comparative poverty, at Toronto, in August 1861. In 1822, he married Isabel Baxter, a sister of Mr. George Baxter, teacher of the Royal Grammar School at Kingston, and the same from whom so many of our prominent Canadians received their early tuition. He left seven children. Taken from "William Lyon MacKenzie", by Charles Lindsey, 1909. Chapter I - The Period and the Man. 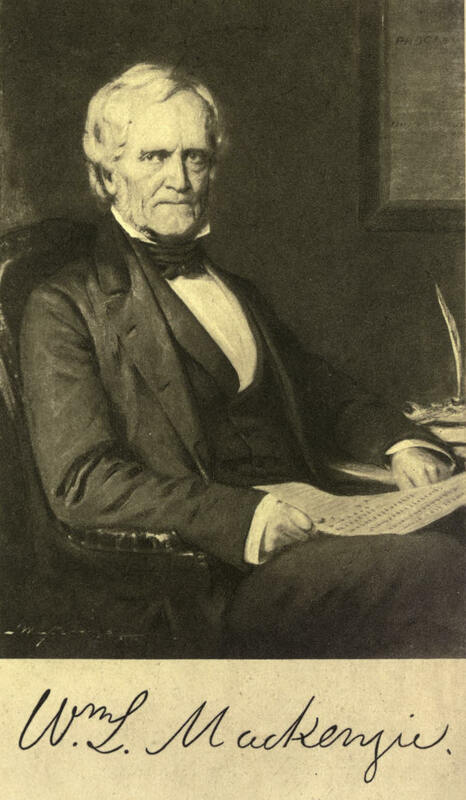 THERE are many circumstances which give to the life, character and career of William Lyon Mackenzie a peculiar and almost pathetic interest, and which render them well worthy of a permanent record in the memoirs of the "Makers of Canada." They not only represent the strong mental and moral equipment of an individual—one of a race which has been identified with constitutional liberty and reform in all the overseas states of the Empire—but they also represent an important epoch in British colonial history. It was an epoch of political transition, and Mackenzie stands out in it conspicuously, a commanding and picturesque personality who did much to create, as well as to inspire and promote, the movement which made the transition one from an evil to a better state of things. He was a representative man of the period —a man of thought and resource who had a genius for successful political agitation—a man of action who, as a distinguished publicist has said, "embodied the sentiment of his time" in working towards political ideals in the State. If it be true that 11the types of men living at particular periods afford the best studies of history," Mackenzie cannot be ignored by the historian. The great interest which attaches to his life, especially in his years of strength and vigour, is derived from the fact that it extended over a period of political and critical unrest with the spirit and action of which he was completely identified. Mackenzie in those years had to be reckoned with, at every turn in the arena, by the men who governed; and he must be given a place by himself, but none the less a distinguished place, amidst the conflicting influences, and the strifes and antagonisms which, culminating in a civil war, wrought a revolution in the system of government in Canada, and thereafter in British colonial government everywhere. That was an issue which, it has been well said, "evolved out of the discord of conflicting ideals, the foundations of a permanent and worthy settlement of the relations of the Crown to the colonies," and "broadened, once for all, the lines of constructive statesmanship in all that relates to the colonial policy of England." There probably never was a period in the history of this country when the two political parties were more sharply divided, and more clearly distinguished, upon a great public question. It was a comparatively small forum for such a debate; the cause was worthy of a greater tribunal than that to which the argument was addressed. But the final judgment in the matter was momentous and far-reaching in its consequences. The principles which were laid down by the Reformers in that controversy, under the leadership of Mackenzie and his coadjutors, were those which were embodied by Lord Durham in his famous Report, and were subsequently crystallized into legislation by the parliament of Great Britain. They are the principles upon which the Australian commonwealth and the states of South Africa, as well as Canada, are governed to-day, and by which, in fact, in all the outlying dominions of the Crown, imperial unity is reconciled, and may continue to be reconciled, with complete self- government. Mackenzie has been described as "a reformer ahead of his time," as "the stormy petrel" of the ante-rebellion era in Upper Canada, and in other terms, less equivocal and less deserved, by the calumny which pursued him to his grave. Mr. Goldwin Smith's portraiture of him is that of "a wiry and peppery little Scotchman, hearty in his love of public right, still more in his hatred of public wrong-doers, clever, brave, and energetic, but, as tribunes of the people are apt to be, far from cool-headed, sure-footed in his conduct, temperate in his language, or steadfast in his personal connections." These references to Mackenzie's personal qualities and character as a public man might easily be multiplied. He had at all times, even when political feeling ran high in the constituencies, friends and admirers amongst men of all parties. Speaking of his election for Haldimand, the first open constituency after his return from exile, when he defeated the late Hon. George Brown, the most formidable opponent he could have encountered, a prominent resident of that county stated, in a published interview, that "Mackenzie had support from Conservatives as well as Reformers; in fact, as I happen to know, be always had a great many warm Conservative friends, who admired his pluck as well as his independence and honesty." Arid referring to his election as first mayor of Toronto, a Conservative historian has written that "the combined suffrages of his party supporters and of the moderate Tories placed him in the office of chief magistrate of the city. It has never been doubted that the choice then made was a good one. It is but fair to the memory of Mr. Mackenzie to say that, in all his political conduct and extravagances, he was not actuated by personal resentment. He was a determined advocate of reform, and in his political course made himself many enemies, but they were not personal, but political enemies." "Mackenzie died, as he had lived, a poor man," said one of the most brilliant writers on the Canadian press. "Throughout his second political career, he was an ultra-Reformer, one might almost say an irreconcilable. Although he had seen enough of republicanism to dislike it, he remained a Radical to the last. Had he been so disposed, he might have taken office in the short-lived Brown-Dorion administration; but he loved the freedom of his independent position, and would have proved restive in official harness. Whatever his faults of judgment and temper may have been, he was, beyond question, an honest, warm-hearted and generous man. That he should be a free lance in politics was to be expected from his antecedents and his temperament; but there was always a bonhomie about him which made even those he opposed most strenuously his warmest personal friends. ....In looking back upon a career so unfruitful on the surface, and so unprofitable to himself, the natural verdict will be that it was a failure. Still, when it is considered that he was the pioneer of reform, the first who formulated distinctly the principle of responsible government, among the first to advocate a confederation of the provinces, and, above all others, the man who infused political vitality into the electorate, we cannot say that he lived in vain. Like other harbingers of a freer time, he suffered that the community might enjoy the fruits of his labour, the recompense for his misfortunes. When responsible government was at length established, he was chafing as an exile in a foreign land. When he re-entered politics, the battle had been won, and others had reaped the reward. With all his faults, and he had many, no man has figured upon the political stage in Canada whose memory should be held in warmer esteem than William Lyon Mackenzie." There is a measure of truth in all these descriptions, and in others of a similar character which might be recited. Reformers who are earnest and sincere are seldom other than "ahead of their time," and one of the sacrifices which they have to make, if they are true to their ideals, is the sacrifice of "personal connections," and sometimes also of political friendships. History is full of examples of this species of independence and passion for an idea. Lord Durham, whose services to Canada can never be forgotten, and whose memory will ever, be revered by the Canadian people, was, as a commoner, his biographer tells us, "far in advance of his times. The Whigs of that generation, his own political allies, did not share his desire for "sweeping reforms," and especially his early endeavours to destroy the "rotten boroughs" of England. He was often regarded by them with petulant impatience, and even as a thorn in their side, but he never wavered in his allegiance to what he regarded as the first conditions of progress, and he stood, all through the reign of George IV, like an incarnate conscience in the path of the official leaders of his party. . . . They were convinced that parliamentary reform had not yet come within the range of practical politics. "But all this did not deter him from breaking away from his personal and political alliances, and proposing a bill for the reform of parliament eleven years before it was carried, and before "the new era of government by public opinion began"
To say that Mackenzie was "a reformer ahead of his time," is only to say, as the fact was, that he typified opinions in favour of a system of government, lines of policy, and methods of administration, which were in sharp and hostile contrast to those which were stubbornly, and at times oppressively, adhered to by his adversaries, and of which he was the uncompromising and implacable foe. Mackenzie's ideas of civil government and administration were entirely opposed to those of the military and semi-military rulers who represented the Crown in Upper Canada, and to those who, firmly entrenched in their offices and privileges and having the whole power and patronage of the executive at their command, were set about those men, during the most strenuous years of his career. But they were ideas which, although since carried out to the fullest extent, were all but dormant when he appeared on the scene. Mackenzie inspired them with life and vigour. His propaganda gave them a powerful hold on the public mind, and a momentum that was irresistible. It was his long, unselfish and self-sacrificing struggle, amidst enormous difficulties and against tremendous odds, which first aroused the people to a true sense of their citizenship, and to the real value of those free institutions which were their just heritage. And it was he who, though aided by other able men, unquestionably bore the brunt of the battle for constitutional reform. In his course of action in regard to these things, Mackenzie did not always wait to see whether the principles which he espoused were practicable. He had the courage to advocate an opinion long before it was ripe for realization. What he believed to be good for the commonwealth he did not hesitate to say was good, and he supported it with all his might as a journalist, on the platform, and in parliament—brooking no opposition from friend or foe—whether public opinion was prepared for it or not. To this extent he was not what might be called a "practical man"—a charge which he sometimes had to meet—in politics. To this extent, also, he was "ahead of his time" and inconstant in his "personal connections." He was not of those who would support or oppose any proposal or measure on the principle of mere political expediency. He had in fact a scorn of expediency and a hatred of half-measures in the presence of justice. Neither did he oppose a measure at a particular time because it was impracticable, and support it only when it could be carried;1but whatever his attitude, he could give, and almost invariably did give, practical reasons for his support or opposition In all questions, great or small, involving honesty, purity and uprightness in public life, economy in the public expenditure, prudence and thrift in the preservation of the public domain, and a full recognition of the constitutional rights of the people, his voice and pen and action were never uncertain. These things lay close to his heart, and their opposites had his relentless hostility. Mackenzie is also one of the "old Liberals" against whom party in its madness was wont to hurl relentlessly the taunt of disloyalty. How far the taunt was really deserved, the readers of this volume must be left to judge. Many of them may remember that the chiefs of the insurrection, and the great body of their friends and supporters, were still living when the famous apothegm of Junius was adopted as its motto by the leading Reform journal of Canada. Mackenzie believed in the truth which it enunciated and acted on it. It was one of the articles of his creed that "the subject who is truly loyal to the chief magistrate will neither advise nor submit to arbitrary measures." He carried the doctrine to extremes; but, as was said by the reviewer in dealing with the fact, one should not "fail to see the group of events as it stands in its historic surroundings, and to judge the acts and actors with a fair and comprehensive reference to the circumstances of the period." "Loyalty" in those days, if we may judge by some occurrences, was an equivocal and easily convertible virtue. The despatch of a colonial minister to the lieutenant-governor of Upper Canada, making some concessions to the long-enduring people of the province, and dismissing two law-officers of the Family Compact for their tyrannical conduct treatment which was mildness itself compared to the unremitting and, at times, brutal persecution to which Mackenzie was subjected—was sufficient to sap the "loyalty" of the Compact, and to call forth threats of alienation from 1the glorious Empire of their sires," and of "casting about for a new state of political existence." The question of loyalty involved in the rebellion itself is no longer the debatable question it once was. There is a great deal, as we shall see, in connection with the circumstances leading up to that event, to palliate and excuse it, if not to justify it absolutely. And, judging by the later literature on the subject, controversial though some of it may be, this is the view which is now all but universally entertained. In any case the responsibility for the insurrection, deplorable as it was, should not be made to rest on Reformers, who, after long years of heroic but fruitless effort to effect a change in the system of government by constitutional means, were at last goaded by their rulers into asserting the justness of their cause by physical force. The history of political agitations which have culminated in great political reforms, or in revolutions which have compelled reforms, proves that, in nearly every instance, the dominant power or party against whom the agitation has been directed has refused to believe in the popular demand until revolution either actually came, or was no longer capable of being resisted. "History proves that the rights of constitutional liberty, which British subjects enjoy to-day, have only been obtained by agitation, and, in some cases, by the exercise of force. Magna Charta, the greatest bulwark of British liberty, was forced by the barons from an unwilling monarch. Other incidents in history show that grievances have only been remedied when the oppressed, despairing of obtaining success by lawful agitation in the face of opposition by entrenched officialism, have been compelled to fly to arms in defence of their rights. Few will deny to-day, in the light of history, that the cause of constitutional government in Canada was materially advanced by the action of William Lyon Mackenzie, and that results have justified the rising of 1837." "It was one of a series of revulsions of popular feeling, recorded in British history, which has extended and broadened incalculably the liberties of the British race and nation." "It may be that Mackenzie was impetuous and turbulent, but the rebellion of 1837 was at best a pitiful expression of the discontent which the greed and the oppression of the Family Compact had developed. Too much has been said of the rash counsels and unhappy adventures of Mackenzie, and too little of the crying grievances which an insolent and autocratic executive would not redress, and of the privileges they were resolved to maintain. It is in such fashion that the decisive blow has been dealt to tyranny and privilege all down the splendid centuries of British history; and if in the story of Liberalism in all countries there are wild and sanguinary chapters, it is because only in that way could popular government be established and perpetuated." "Did the pages of history," said Lord Durham in one of his great speeches on the Reform Bill, "not teem with instances of the folly and uselessness of resistance to popular rights? The Revolution of 1741, the French Revolution of 1789, the separation of the North American colonies, might all have been averted by timely and wise concession. Can any man with the slightest knowledge of history attempt to persuade me that if Charles I, after the Petition of Right, had kept his faith with his people, he would not have saved his crown and his life? Again, with reference to the French Revolution, I say that if Louis XVI had adopted the advice given by his ministers, the people would have been satisfied, the ancient institutions of the country ameliorated, the altar, the throne, and the aristocracy preserved from the horrible fate which afterwards befell them. Twice had Louis XVI opportunities—first, under Turgot's ministry, secondly, under Necker's—of conciliating the country, and averting that fatal catastrophe by limited concessions. The nobility resisted and the Revolution followed. I need only add my conviction that, if after the repeal of the Stamp Act, England had not destroyed all the benefit of that concession by the Declaratory Act, and the re-imposition of the tea duties, North America would at this hour have been a portion of the British Empire. The course of events has always been the same. First, unreasoning opposition to popular demands; next, bloody and protracted struggles; finally, but invariably, unlimited and ignominious concessions." Durham might also have referred to the other French Revolution of 1830, when Charles X was deposed for his persistent endeavours to maintain an unpopular ministry in power, or he might have cited the revolt of Belgium against Holland, leading to its creation as an independent kingdom events, we are told, "which were hailed with outbursts of enthusiasm in England, and perceptibly quickened the demand for reform." In Great Britain itself, Catholic Emancipation and the Parliamentary Reform of 1832 were only conceded when the country was on the brink of revolution. "Agitation had evidently obtained for Ireland what loyalty and forbearance had never procured; and though the fear to which our statesmen had yielded might be what Lord Palmerston asserted, 'the provident mother of safety,' a concession to it, however wise or timely, gave a very redoubtable force to the menacing spirit by which concession had been gained. "Sir Robert Peel "was proud of having made a great sacrifice for a great cause [namely, Catholic Emancipation]. There can be little doubt that he had prevented a civil war in which many of the most eminent statesmen of foreign countries would have considered that the Irish Catholics were in the right."' And, speaking of the Reform Bill, the same writer says that "some plan of Parliamentary Reform had of necessity to be proposed. The true Conservative policy would have been to propose a moderate plan before increased disquietude suggested a violent one." "He [Peel] was converted with respect to the Catholic question, and was converted to Liberal views, but when he professed this conversion, it was to save the country from civil war. He was converted with respect to the Corn Laws, and was converted to Liberal convictions; but when he professed this conversion, it was to save the country from famine. " Referring to the Duke of Wellington, Durham's biographer says, that It his solitary claim to political regard is that he eventually extorted a reluctant consent from the king for Catholic Emancipation—a concession which lost all its grace because it was the outcome of panic, and could no longer be refused without peril . . . . . . It became law only after a protracted and bitter struggle, which brought Ireland to the brink of rebellion." And, referring to the rejection by the Lords of the second Reform Bill, he says, "Lord Grey at once moved the adjournment of the House, and the country stood on the brink of revolution ......The king seemed to have forfeited his popularity as if by magic, and the people, in their bitter disillusionment, were prepared to go almost any lengths— even to that of armed resistance—rather than submit to the contemptuous refusal of their just demands. . . Riots occurred in many towns, and whispers of a plot for seizing the wives and children of the aristocracy led the authorities to order the swords of the Scots Greys to be rough sharpened. It will probably never be known how near the country came at that moment to the brink of a catastrophe which would have overturned both law and order . . . . . . The Reform Act was a safety valve at a moment when political excitement had assumed a menacing aspect, and the nation seemed on the verge of anarchy." "The chiefest authors of revolutions have been, not the chimerical and intemperate friends of progress, but the blind obstructors of progress; those who, in defiance of nature, struggle to avert the inevitable future, to recall the irrevocable past; who chafe to fury by damming of its course the river which would otherwise flow calmly between its banks, which has ever flowed, and which, do what they will, must flow forever." It is not necessary to institute any comparison with these great political and revolutionary movements, in other countries, in order to excuse or justify the revolutionary movement for constitutional reform which lay at the root of every other reform in government and administration in Canada. The evidence is overwhelming as to the grievances suffered by the people, their endeavours to remove them by legitimate means, and the absolute refusal of their reasonable demands by the advisers and representatives of the Crown. These latter, as was truly said, were living in "an atmosphere of constitutional fiction." Lord John Russell, a representative Whig, and the member of a Whig administration, speaking in his place in the House of Commons of the demands of Lower Canada, said "The House of Assembly of Lower Canada have asked for an elective legislative council, and an executive council which shall be responsible to them and not to the government and Crown of Great Britain. We consider that these demands are inconsistent with the relations between a colony and the mother country, and that it would be better to say at once, 'Let the two countries separate,' than for us to pretend to govern the colony afterwards." And, speaking in the same place, only nine months before the actual outbreak in 1837, he said that "cabinet government in the colonies was incompatible with the relations which ought to exist between the mother country and the colony. Those relations required that His Majesty should be represented in the colony not by ministers, but by a governor sent out by the king, and responsible to the parliament of Great Britain. Otherwise Great Britain would have in the Canadas all the inconveniences of colonies without any of their advantages." These opinions of the colonial minister were endorsed by the imperial parliament in resolutions of both Houses passed on April 28th and May 9th, in the same year (1837). The resolution refusing the concession of responsible government declared "that while it is expedient to improve the composition of the executive council in Lower Canada, it is unadvisable to subject it to the reponsibility demanded by the House of Assembly of that province." Amendments favouring the recognition of responsible government were moved in the House of Commons, but were rejected; and Lord Brougham entered his dissent, with reasons, on the journals of the House of Lords. In a despatch to Lord Sydenham, as late as October 14th, 1839, which deals with the great "difficulty" Sydenham may encounter "in subduing the excitement which prevails on the question of what is called responsible government," Lord John Russell lays special stress on the action of the imperial authorities more than two years before. "The Assembly of Lower Canada," he says, "having repeatedly pressed this point, Her Majesty's confidential advisers at that period thought it necessary not only to explain their views in the communications of the secretary of state, but expressly called for the opinion of parliament on the subject. The Crown and the Houses of Lords and Commons having thus decisively pronounced a judgment upon the question, you will consider yourself precluded from entertaining any proposition on the subject. It does not appear, indeed, that any very definite meaning is generally agreed upon by those who call themselves the advocates of this principle, but its very vagueness is a source of delusion, and, if at all encouraged, would prove the cause of embarrassment and danger." The despatch shows clearly enough that the home government saw difficulties, under certain circumstances,— theoretical and imaginary they really were,—in the application of the principle of executive responsibility to a colony, but none, as the minister states further on in his despatch, "to the practical views of colonial government recommended by Lord Durham," as he understood them.' What is important, however, to notice is, that the attitude and policy of the home government, above indicated, with respect to Lower Canada, prior to the outbreak, were just the same with respect to Upper Canada. The true remedy that was sought for the grievances complained of was distinctly refused to both provinces. It made no difference who was at the head of the colonial office, Tory or Whig, the answer to the petitions for redress was, in effect, the same. Glenelg was of opinion that, "in the administration of Canadian affairs, a sufficient practical responsibility already existed without the introduction of any hazardous schemes "which "schemes," be it added, were what really brought "peace with honour," by the men who advocated them, to this country. In Upper Canada the answer was sufficiently galling. Sir Francis Bond Head's reply to the protests of his executive council on one occasion was, that he was the sole responsible minister, and that he was only bound to consult his council when he felt the need of their advice. "The lieutenant-governor maintains," said he "that responsibility to the people, who are already represented in the House of Assembly, is unconstitutional ; that it is the duty of the council to serve him, not them." The message exemplified the man, and was a mild epitome of the arbitrary theory and practice of executive responsibility which prevailed during his own and the previous regimes, but which was effectually shattered by the insurrection. How far the insurrection of 1837 can be excused or justified, is a question upon which every thoughtful person must form his own conclusions from a perusal and consideration of the history of the time. The question is a practical and not an academic one, for no one admits that rebellion against a regularly organized government is never justifiable. The data for an impartial judgment are largely supplied by the narrative of events and the commentaries thereon, which are contained in the pages of this volume. For a considerable period following the outbreak, public opinion in Canada and in England, for reasons which need not be discussed here, was condemnatory of the appeal to physical force, but it was far from unanimous; it was impossible that it should be unanimous. The movement failed in the field through no lack, as the historian has told us, of capacity and courage on Mackenzie's part; still it failed, and there was a natural reaction of sympathy and opinion, stimulated by the aftermath of the frontier disturbances, against the movement and those who were concerned in it personally and politically, as well as against the party with which they were identified. Greater patience, renewed petitions and protests, firmer faith in the disposition and willingness of the imperial authorities to accede to the constitutional changes so earnestly and unavailingly demanded, would, in due time, it has been said, have ensured a responsible executive and the full and complete benefits of parliamentary government as it was in Great Britain. The political tendency of the times was favourable to Liberal doctrines and constitutional reform, and the home government had already been moving, and would continue to move, in that direction. Such is the argument, in brief, usually made against the movement. The reply is interrogatory. How long must a free people, entitled to freedom and all the other benefits of British institutions, and fit for self-government, endure the tyranny, oppression, and general viciousness of such a system as prevailed prior to 1837? What is the time limit in such a case, for history has set such a limit in some other cases? Determined as was the attitude of the people of Upper Canada, startling and significant as was the warning conveyed by the insurrection, and intensely dissatisfied and alienated, according to Lord Durham and Lord Sydenham, as large numbers of the most law-abiding persons in the province were, even after the rebellion was crushed, —the old system was long in dying. Under circumstances and influences that one would have supposed had greatly hastened its demise, it died hard; for not until the régime of Lord Elgin, more than ten years after the first angry shot was fired in the Canadian provinces, were the long-looked-for measures of remedial justice and reform fairly and fully in force.1 If, said the Reformer, under such adventitious aids backed by a rebellion de facto (strong or weak, it matters not), the people had so long to wait, how long must the waiting have been —how long the practice of the virtues of patience and forbearance, had Upper Canada never beheld a "rebel" in arms? Questions like these have occasionally provoked an answer. Mr. W. J. Rattray, a thoughtful pub- heist and writer on historical and political subjects, has given it as his opinion that, were it not for the rebellion, many years must have elapsed before the British government would have consented to carry out the reforms advocated in Mackenzie's "Seventh Report on Grievances," and subsequently recommended by Lord Durham. "Had these concessions," he says, "been only made three years before, there would have been no rebellion; and it may safely be affirmed likewise that, but for the rebellion, responsible government would not even now have been granted." Other answers have been given at different times, either in the columns of the newspaper press, or in public speeches and addresses. But, in whatever form they have appeared, they show that public opinion with respect to the rebellion, aided as it has been by historical research and a calmer and more deliberate consideration of the causes and outcome of the whole movement, has been greatly modified in the intervening years. The origin and history of the insurrection in Canada have also, within very recent years, occupied public attention in Great Britain and South Africa, in connection with the rebellion and the terribly destructive war which followed in that part of the king's dominions. Comparisons were not unnaturally made between the condition of affairs at the seats of rebellion in each country prior to the outbreak, and the justification in each case for the revolt. It is worthy of notice that the historic parallel, on the score at least of provocation and justification, is favourable to Canada and to those who took part in the insurrection in these provinces; and such evidently was the opinion of the British government, and of public opinion in Great Britain, so far at any rate as it was represented in parliament. The revolt in Canada was officially stated to be "founded on grievances under constitutional conditions which were recognized as unsatisfactory by the government of the day and altered by subsequent legislation. In the Cape there has been adhesion to the Queen's enemies, during war, of those who have not even the pretext of any grievance, and who have for a generation enjoyed full constitutional liberty." It was "unnecessary," wrote the ministers at Cape Town to Sir Alfred Milner, "for the purpose of tracing the mode of dealing with those guilty of the crime of rebellion or high treason in Canada, to give any history of the causes which led up to the rebellion in Upper and Lower Canada. In both cases the disturbance had its origin in a conspiracy for the redress of grievances which were more or less well grounded, and recognized as being so by the reforms which followed the outbreak."' And speaking on the same point, in his place in the House of Commons, in a debate on the address (January 20th, 1902), when the policy and conduct of the government were under criticism, the colonial secretary, Mr. Chamberlain, said: "Just let me for a moment, in two or three words, remind the House what took place in Canada. The Canadians had great grievances, which the Cape rebels had not. The Cape rebels had every liberty, every right, every privilege which the Canadians desired, or which they have since acquired. There was justification—or an excuse—for the conduct of the Canadian rebels. There was no justification of any kind for the conduct of the Cape rebels. In the case of Canada there was justification which was admitted by subsequent legislation. The wrongs of the Canadians were subsequently redressed, but they were redressed on the initiation of this country, and not as terms or conditions of surrender." Sir Wilfrid Laurier, since he became first minister of Canada, has referred to the rebellion on two notable occasions. Speaking in the House of Commons, on his motion of condolence with respect to the death of the late Queen, he said: "Let us remember that, in the first year of the Queen's reign, there was a rebellion in this very country; there was a rebellion iii the then foremost colony of Great Britain, rebellion in Lower Canada, rebellion in Upper Canada; rebellion—let me say it at once, because it is only the truth to say it—rebellion, not against the authority of the young Queen, but rebellion against the pernicious system of government which then prevailed." The second occasion was the banquet of the Canadian Club in London, England, on July 16th, 1902, when, in responding to the toast of "The Dominion of Canada," he said: "The loyalty of Canada has been enhanced by the free institutions given to her. If it had not been for the charter of liberty which she had received, perhaps the condition of things would have been different. In 1837 Canada was in a state of turmoil and excitement. There was rebellion not only in the province of Quebec, but in the British province of Ontario. The rebellion, in his mind; was quite justified by the unworthy system which then obtained, and by attempting to rule what ought to have been a free people by methods which were unsuited to them. But in 1899, when they had been given a free regime and had a parliament to which the government of the country was responsible, when they had the blessings of responsible government in the same measure that they had in England, when the dominion of her late Majesty was threatened in a distant part of her domain, the very sons of the rebels of 1837 were the first to come to the rescue and to maintain the dominion of Her Majesty in South Africa. That was the result of the wise policy that had been followed with regard to Canada and the other colonies of Great Britain." These various expressions of opinion touching the question of 1837, whence imputations of disloyalty against Mackenzie and the Reformers of his time have been drawn, and which are supplemented elsewhere in these pages, are not unworthy of consideration. The lapse of years, and a clearer and truer perception and understanding of the events in which he figured, of the system of government and abuses which he assailed, of the forces, political and personal, which beset him, and of the man himself, have manifestly wrought a more rational judgment with respect to those old and exasperating matters of controversy. Their true significance is understood as it never was before by statesmen and publicists, and by those who inspire and mould the thought of the nation. "The tumult and the shouting" of crimination and recrimination, which they once provoked, have passed with the passing of the men of the old dispensation; and loyalty to the Crown not being, as in fact it never has been, the exclusive possession of any particular party in the State, these old charges of disloyalty, whencesoever they come, must be regarded as a spent force in the politics and government of Canada.